This IBM IBM Redbooks publication presents the information you need to plan for and run an IBM z/OS system with support for z/OS UNIX System Services (z/OS UNIX) and z/OS.e. 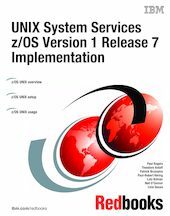 It provides information to facilitate the installation and use of z/OS Version 1 Release 7 UNIX System Services, and step-by-step instructions on how to install, customize, and use the z/OS UNIX System Services product set. This book is written for MVS systems programmers who install and customize the z/OS UNIX System Services product set. Practical examples are presented to demonstrate the installation and customization of UNIX System Services. This includes examples of the customization of DFSMS, RACF , TCP/IP, and NFS required to set up a z/OS UNIX System Services environment. Some knowledge of UNIX System Services is assumed.